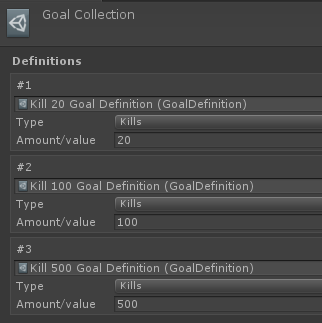 As part of my player progression, I decided to make a “goal” system. A goal being broadly defined as some sort of simple objective to be reached. Kind of like mini-achievements or challenges. A lot of games do these and they really help with having a sort of “progress gauge” on your stuff. They are also nice little rewards for your actions. Sort of like the game is keeping track of your achievements and doesn’t just drop you there and forget. Not sure yet how I will actually display and organize these, but at least I have the concept ready. It can then compare all the target goal values to in-game tracked values based on goal types. There’s quite a lot of hard-coding in the code for this, but it cannot be avoided. 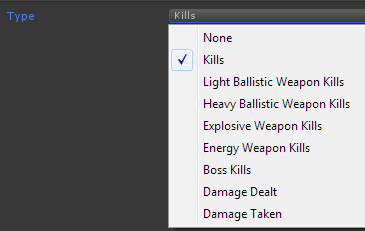 After all, there’s one place kills are registered, another where enemy types are tracked, another where damage is received, etc. But I am keeping it all cleanly organized so I don’t make a mess of inter-system wiring. 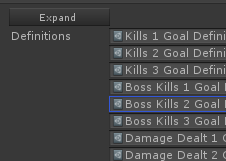 Also similar goals share code, like the Kills 1/2/3 ones, so I only even write code for checking kills once. I am not yet sure how I want to split these — do I use both, only one? I will probably award experience for specific tasks and give bonuses for numerical milestones. Now I just need to create and fill out and wire a whole lot of goals… oh boy. I’ll discuss this separately. Not to mention UI, which I will also discuss separately later.